Don't Mess with Our Tutu.... <br> <br> This wonderfully Faerie-esque creation floats and flounces all over the place! 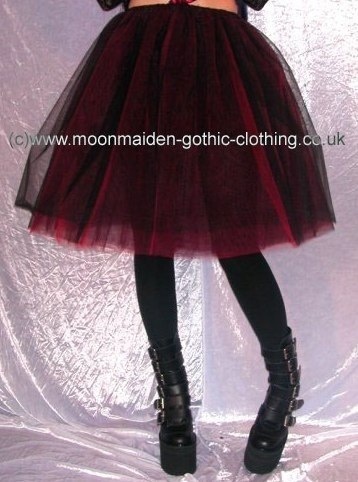 It's made from layers of black and contrasting net, with an elasticated velvet waistband.<br> <br> Perfect for any woodland sprite, water nymph or Foxy Faerie!<br> <br> The normal Tutu is see-though, due to the nature of the fabric; but we can put a later of satin lining to stop this and make it look even prettier for an extra £2.00 - see below for colour choices! This wonderfully Faerie-esque creation floats and flounces all over the place! It's made from layers of black and contrasting net, with an elasticated velvet waistband. Perfect for any woodland sprite, water nymph or Foxy Faerie! The normal Tutu is see-though, due to the nature of the fabric; but we can put a later of satin lining to stop this and make it look even prettier for an extra £2.00 - see below for colour choices!